This mountain, the highest in the municipality of Grong, is located near (east side) of Hwy. E-6, north of the village Grong. 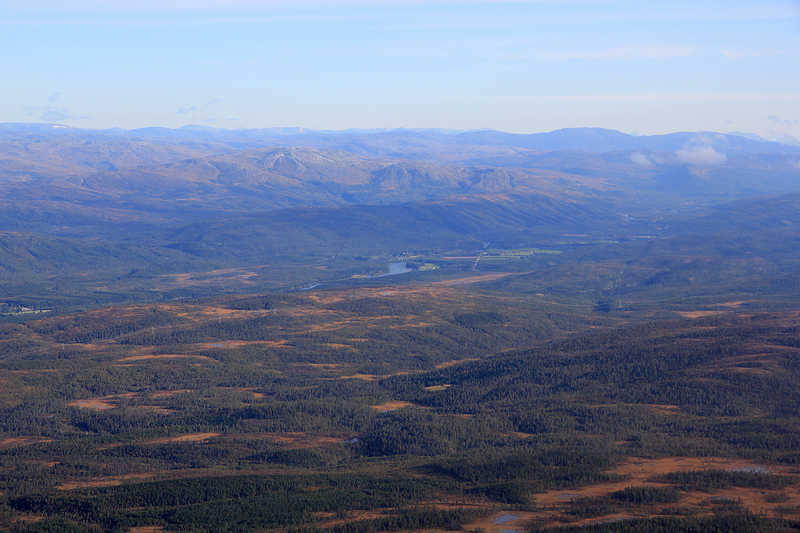 Coming from the south, locate the intersection with E-6 signed for Namsos (road going left). Measure from here. Drive 21 kilometer north on E-6. You should now be at location N64:35.240, E012:33.721. Turn right here (small farm road) and follow this road (left, then right) until it ends at kilometer 22.2. This is a trailhead, location N64:35.174, E012:34.906, elevation about 135 meter. One can easily make this climb from here. Obviously, there are other alternatives, but this location, away from the busy Hwy. E-6, also served me well as a place to camp overnight. From the trailhead, take the leftmost forest track that leads gently uphill. Soon, you will emerge on open wetland and see the first mountain, Litlheimdalhaugen, 886m, in front of you. This mountain has a ridge extending left (west). Pick your way across open land and ascend this ridge where it looks convenient. I ended up close to where it looks as if the ridge connects with the mountain, but a bit further west is also clearly possible. Follow the ridge up to the pretty large and generally flat mountain top. 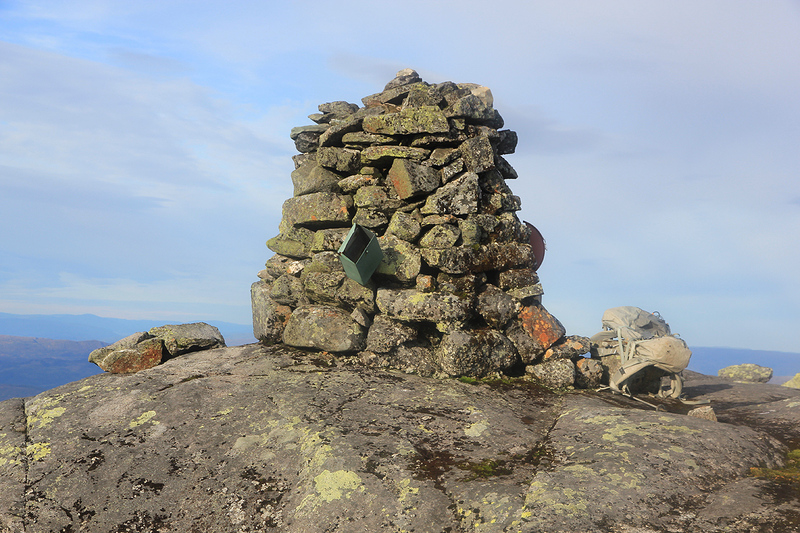 There is a small cairn marking the 886 meter summit. You can now see the goal, Heimdalhaugen, across the connecting saddle. Descend to the wide and fairly broad saddle, the map says the lowest point is in the (780-800) range, my GPS recorded 789 meter. Thus, it is most likely that Litlheimdalhaugen has prominence just short of 100 meter, and I will not include it as an independent mountain. Continue up the ridge towards Heimdalhaugen. There is a short, slightly steeper section quite in the beginning, however, there are traces of a trail and the route remains (YDS) class 2. Higher up, there are multiple routes and several bumps on the ridge that turn out to be false summits. Most likely, the best route stays mainly on the right side of the crest as you approach the summit. 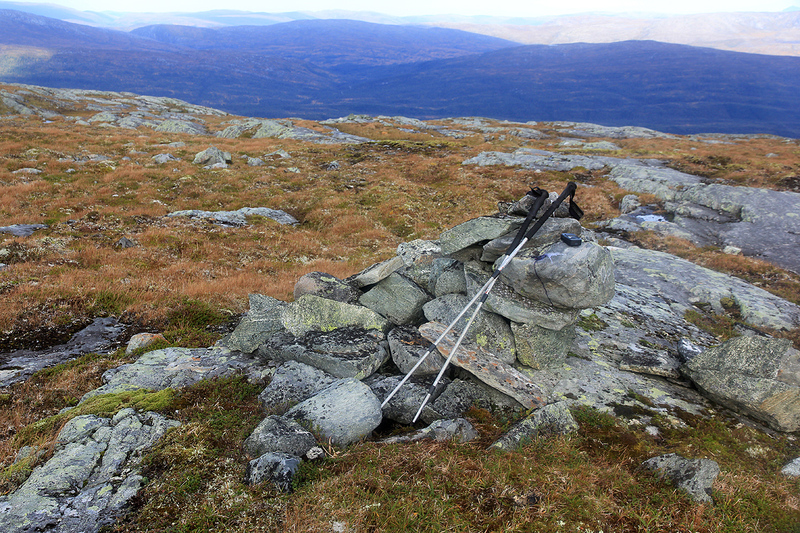 The summit has a nice cairn and a well maintained trail register. 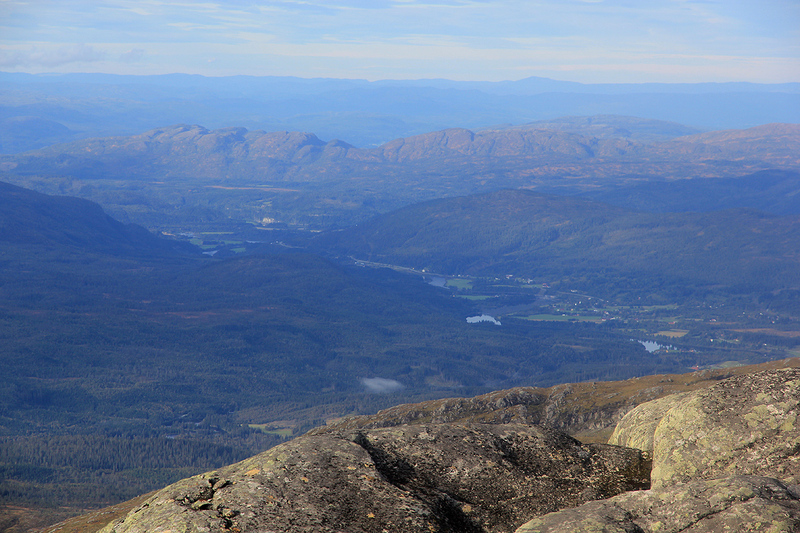 After an 11 hour hike of Kvigtinden the previous day, I wanted a shorter hike before visiting my friend Jostein in Trondheim. 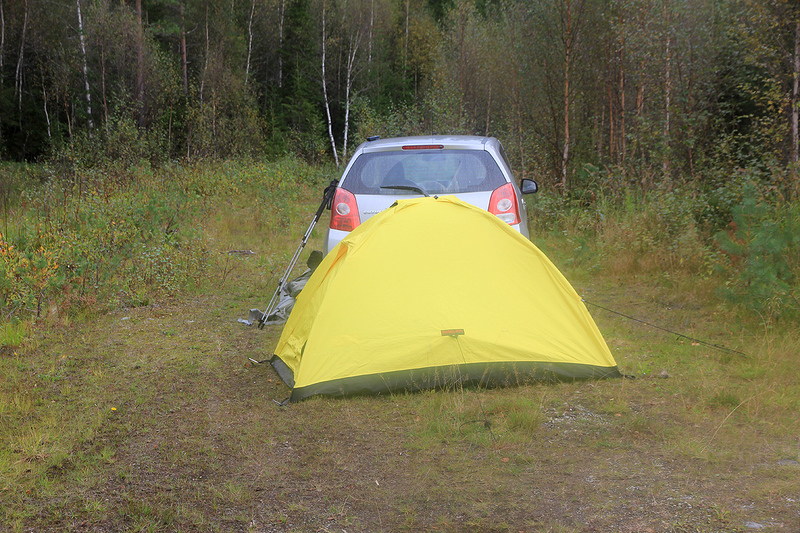 The obvious choice was Heimdalhaugen and I therefore camped at the trailhead the night before. 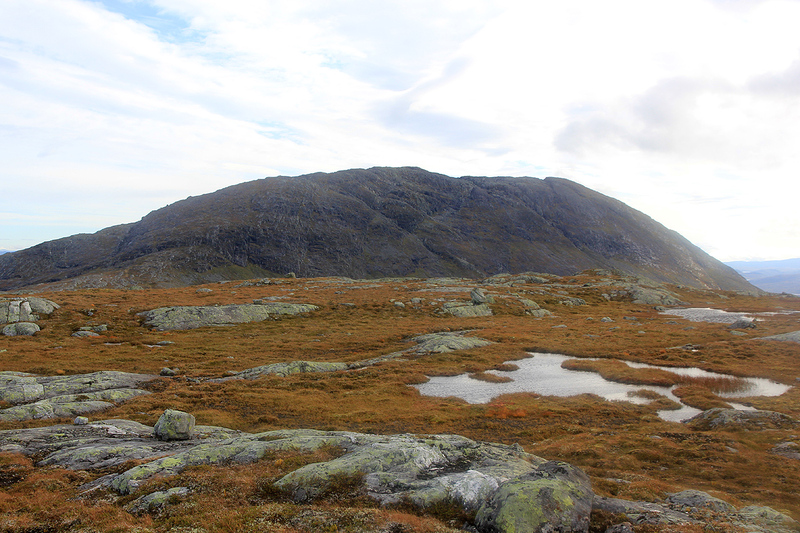 I left at 0545 and picked a good route that got me to the top of Litlheimdalhaugen. From there, the drop to the connecting saddle looked bigger than I had envisioned, in fact, I guessed that the prominence of Litlheimdalhaugen would exceed 100 meter. 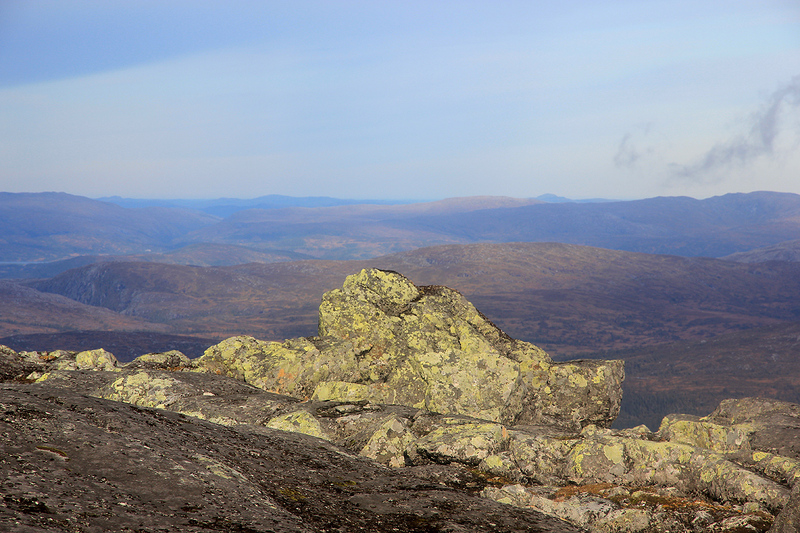 The final ridge to the summit of Heimdalhaugen worked fine until I expected the summit to be quite close. A sequence of false, but fairly complex summits followed. A bypass on the right hand side had been effective, but I scrambled up on each of them only to find out that there was still higher terrain ahead. I arrived at the summit cairn precisely at 0900 and felt happy about my plan to be back at my car before 1200. I signed the summit register and noted that a small party had been here earlier in September. The return hike was more efficient until I was back on Litlheimdalhaugen. From there, I wanted to improve on my way out. However, I totally missed on navigation. 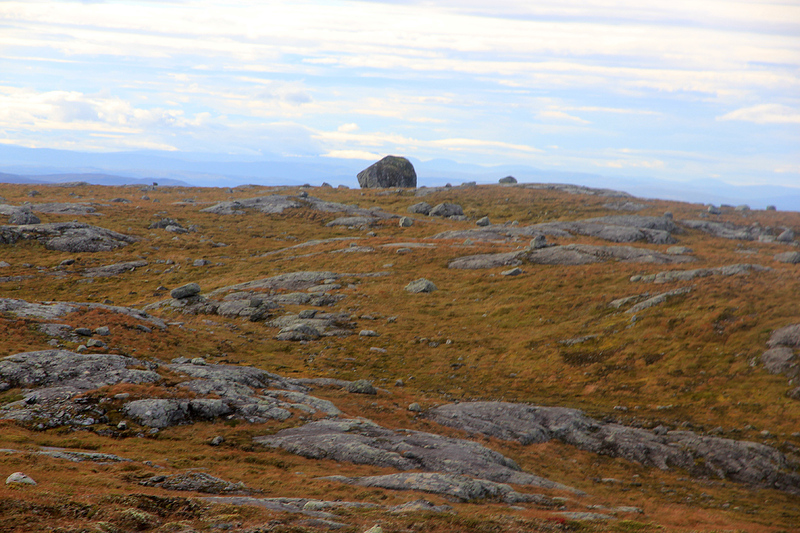 First, I got off the ridge in a very steepish place, forcing some traversing and generally this got me off route. Next, my new route took me across several complex sections with steep hills and dense vegetation. Add to this a creek that ran in its own little canyon, after my third crossing, I was less than pleased. 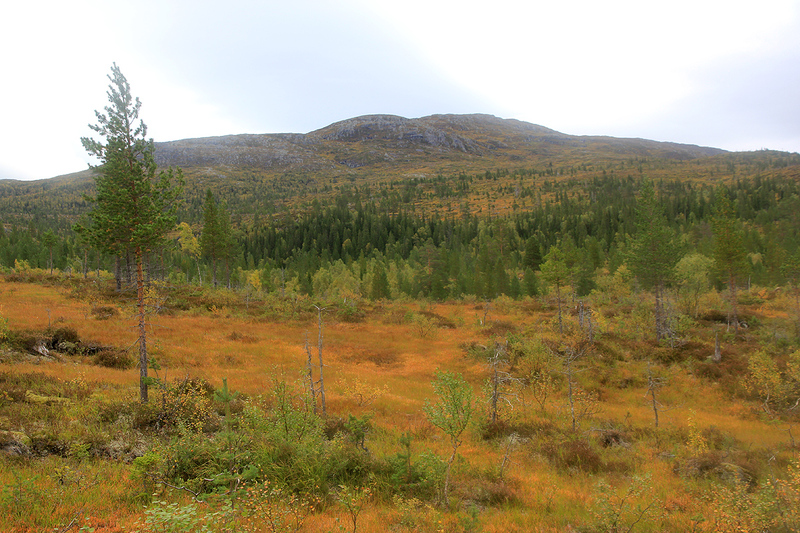 Finally, I found myself in some dense vegetation with a GPS telling me that my car was only 60 meter away. I was back at the car by 1200, but not very happy with my recent navigational performance. Heimdalhaugen, as seen from E-6 on the north side.